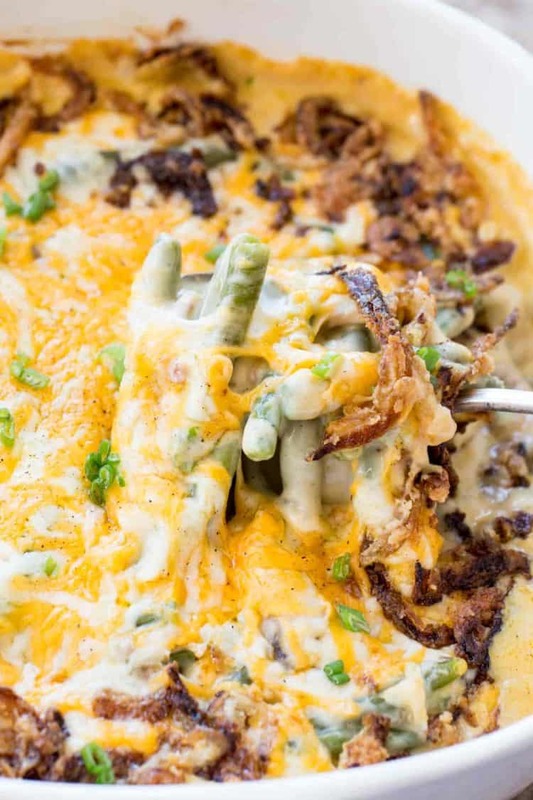 This Green Bean Casserole Recipe is amazing! 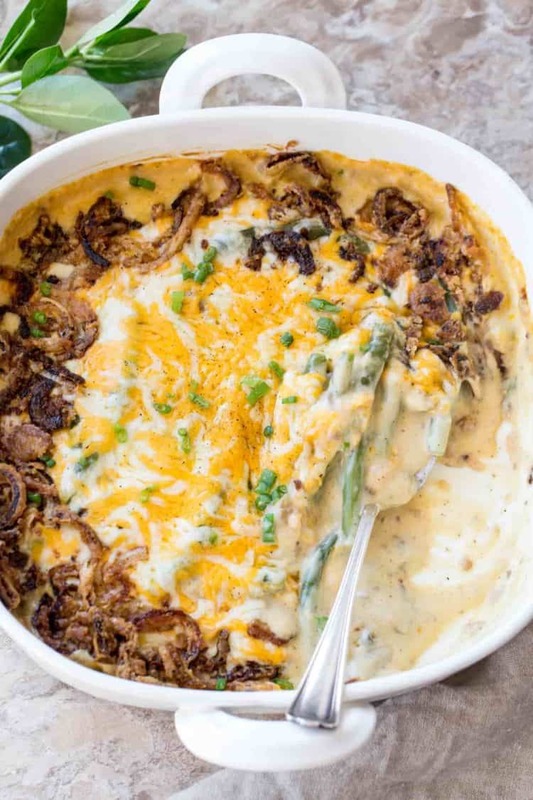 The dish is loaded with fresh green beans and sauteed mushrooms smothered in a creamy sauce and topped with shredded cheese and homemade fried onions. The perfect side dish for any occasion, especially the Holidays! Try these other side dishes like the Cheesy Asparagus Gratin, or Brussel Sprouts with Mushrooms and Chicken and Mushroom Canapes. This green bean casserole from scratch is going to become a favorite! Tender fresh green beans combined with sauteed mushrooms and onion in a creamy mixture, topped with shredded cheese and homemade onion strings. The creamy sauce compliments the green beans and brings out the mushrooms making it the perfect side dish everyone will love. Trim edges of green beans and cook until tender. The green beans make be cut in half if desired. Slice and sautee mushrooms with onion until golden. 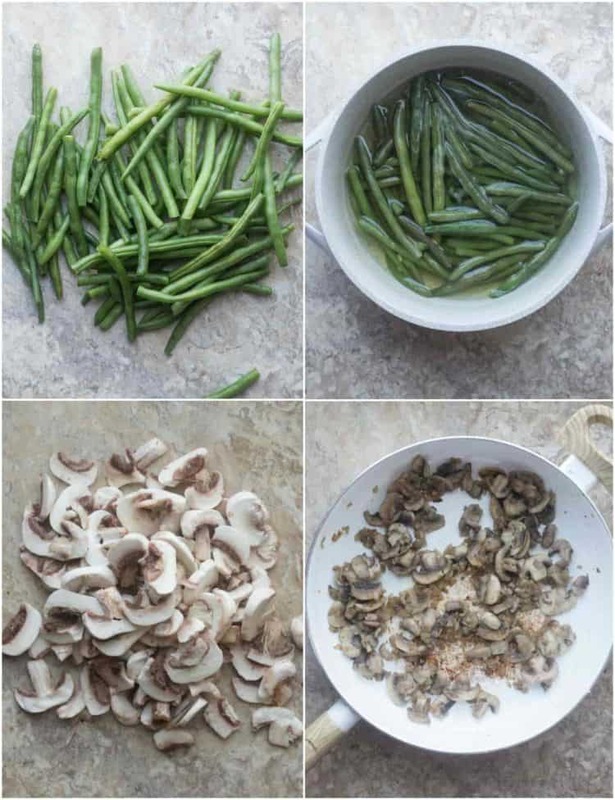 In a casserole dish, combine the green beans with sauteed mushrooms. In a bowl, combine the ingredients for the sauce and pour into dish. Mix well. Top casserole with cheese and onion rings. Cover dish with foil and bake. Though fresh green beans perform best in a green bean casserole, canned beans may be used. To use canned beans, just drain the water and continue with the recipe. DON’T cook the green beans. Use your favorite mixed cheese! 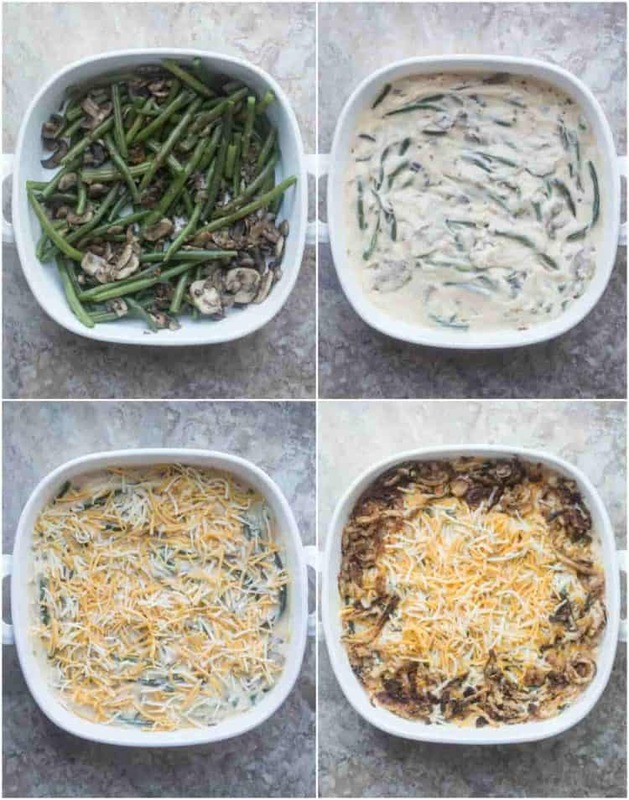 Colby Jack, a combination of Mild Cheddar and Mozzarella will work, or Four Cheese, all of these are great options for this easy green bean casserole. 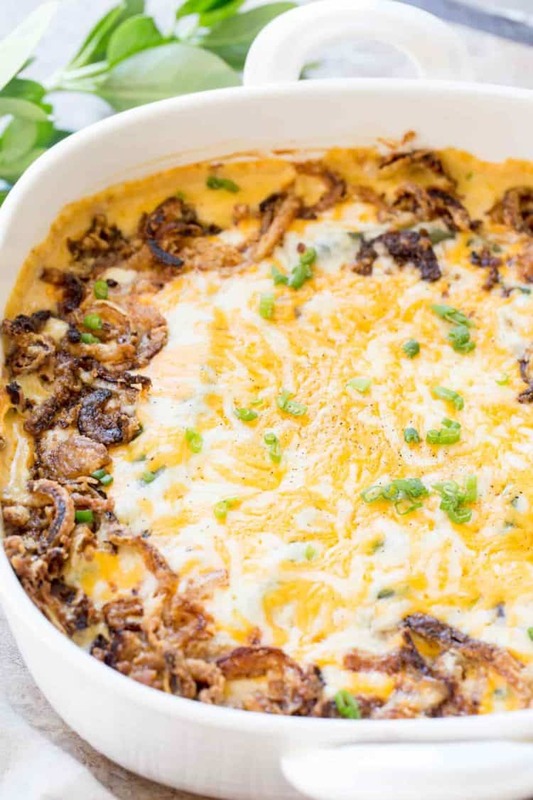 Tools used to make this recipe: casserole dish, skillet, spatula. GETTING TO KNOW YOU: What’s your favorite method of serving green beans? 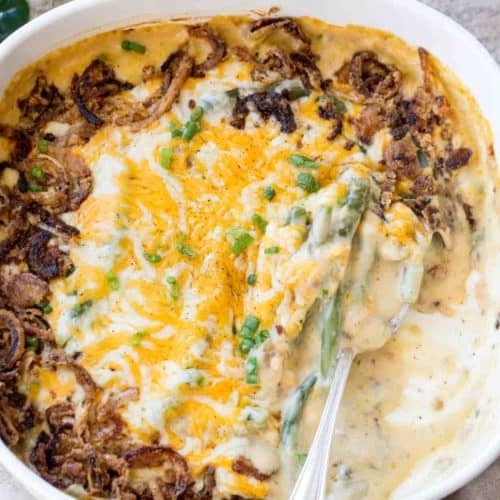 This Green Bean Casserole Recipe loaded with fresh green beans and sauteed mushrooms smothered in a creamy sauce and with shredded cheese and fried onion. Add green beans to a large pot. Cover completely with water. Bring to a boil and cook until tender, about 15 minutes. Drain beans and transfer to a casserole dish. In a skillet, heat 2 Tbsp oil. Saute mushrooms with onions until golden. Slice the other 1/2 of onion, vertically and prepare fried onion strings. optional. Add the mushrooms/onions to the green beans and mix well. Lightly season with salt and pepper. In a small bowl combine all the ingredients for the sauce. Add to the green beans. Mix. Sprinkle the cheese on over everything. Add fried onions to the edges of the dish. Bake covered for 25 minutes in a preheated oven to 375° F. Remove foil, bake uncovered an additional 10 minutes until cream bubbles and cheese completely melts.